Crespo is back from abroad, and he and Jake break down American's wild and whacky season, the Eagles' convincing season-ending win at Holy Cross, and the league as a whole as American will begin the PL tourney vs. Navy Thursday. Jake breaks down American's ninth consecutive loss to Lehigh — this one in its home finale — and looks ahead to the Eagles' regular-season finale at Holy Cross. Listen above, below, or subscribe on iTunes. 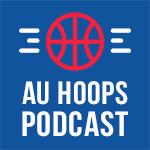 Jake breaks down American's 77-66 win over Army, the Eagles' issues finishing games, and what to expect during the final week of Patriot League play. Jake breaks down American's second consecutive two-point home loss, this one in overtime to Colgate. Listen above, below or subscribe on iTunes.